Not all little monsters have to be scary. 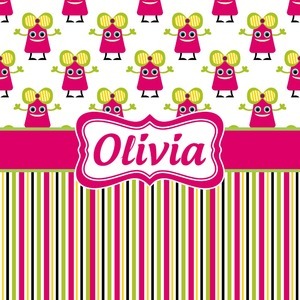 Our one of kind girly girl monster pattern will sure to delight your little one. This little hot pink monster is decorated with a huge green, yellow, and purple bow. Set on a white background she is just begging for a hug. A classic candy striped pattern below using coordinating colors brings this design together. A wide hot pink band trimmed in lime green adds a designer touch. A fun label design makes your little one's name the star of the show.